It’s been awhile since I’ve posted a yummy recipe, but I promised myself I would do more of it as I found new recipes that I enjoy. 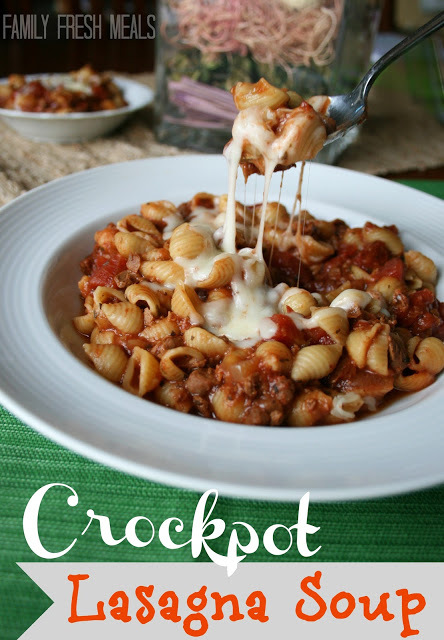 As a full time working mama I’m partial to crock pot recipes. It’s so easy to dump a bunch of stuff in the crockpot before you leave for work and then come home from work with nothing to do but serve what’s been cooking all day for you. I love easy stuff during the week; I NEED easy stuff during the week. This week I decided to try the lasagna soup that I hear everyone talking about and see everyone pinning. The recipe I found was on Pinterest from Family Fresh Meals and it was so good! Serve with some bread and butter and voila! Quick and easy! Enjoy!